In addition to our monthly rides, we sometimes run special events…. If you have any ideas for further activities, please get in touch. Celebrate the arrival of the winter months with a short sociable family-friendly tour round Walthamstow to view local festive decorations & illuminations. You could consider decorating your bike with a bit of tinsel or more – we’ll have a prize for the best decorated bike! Meet at 3.30pm in Walthamstow Village Square (junction of Eden Road & Orford Rd) for setting off at 3.45pm. We’ll cover 4-5 miles and end up back at the Square around 5pm, with the option to retire to a local cafe or pub afterwards. 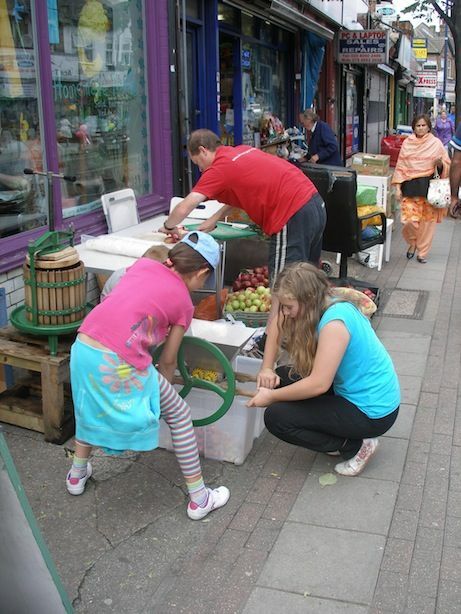 Join us on a fun bicycle assisted apple scrumping ride, to pick apples for pressing at Apple Day in 6 weeks time. 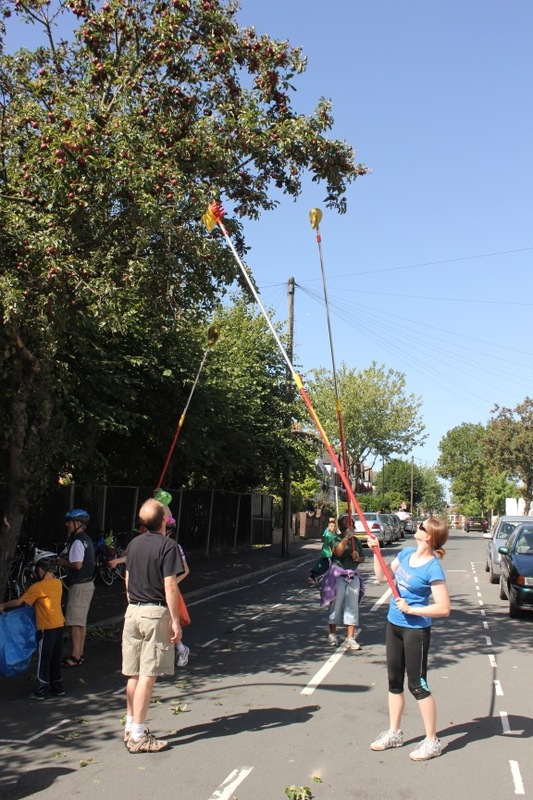 We’ll set off from the Hornbeam Centre with fruit picking poles, bike panniers and trailers, and do some picking of Walthamstow street trees (and possibly one or two back gardens). We’ll then return to Hornbeam to pop the apples into crates lined with newspaper, and will keep them fresh in Hornbeam’s cold store. Our focus will be on apple picking rather than riding, with a round trip of no more than 5 miles. This event will especially appeal (no pun intended) to young people. Meet at 1.30pm outside the Hornbeam Centre (458 Hoe St, E17 9AH, one block from Bakers Arms). Or at 2pm in Walthamstow Village at the junction of Grosvenor Rise East & Wingfield Road, where we’ll be picking from out first tree. This event is free. Apple Day takes place on Saturday 14th Oct at Vestry House Museum. Join us on a short cycle tour through our new, safe & people-friendly residential streets to picnic & play in Lloyd Park. Meet 4pm at Lloyd Park cafe (Le Delice) for the return trip to Village Square. Bring a picnic, or you can purchase food from the cafe. If you’re meeting us there for the picnic, we’ll be in the area just to the north of playground by 3pm. All welcome, especially families with young children. Click here for an A4 flyer. And here for an A5 flyer (2 on an A4 sheet). Note that for the return trip we’re meeting at Le Delice’s cafe in the centre of Lloyd Park (not the one at the William Morris Gallery). 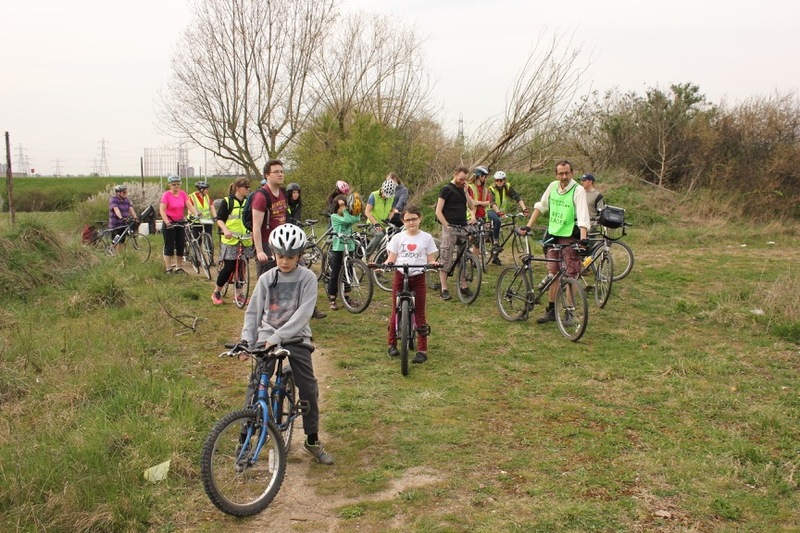 Celebrate the arrival of spring with the Walthamstow Family Bike Club by joining us on a cycle tour of food growing sites in Waltham Forest. 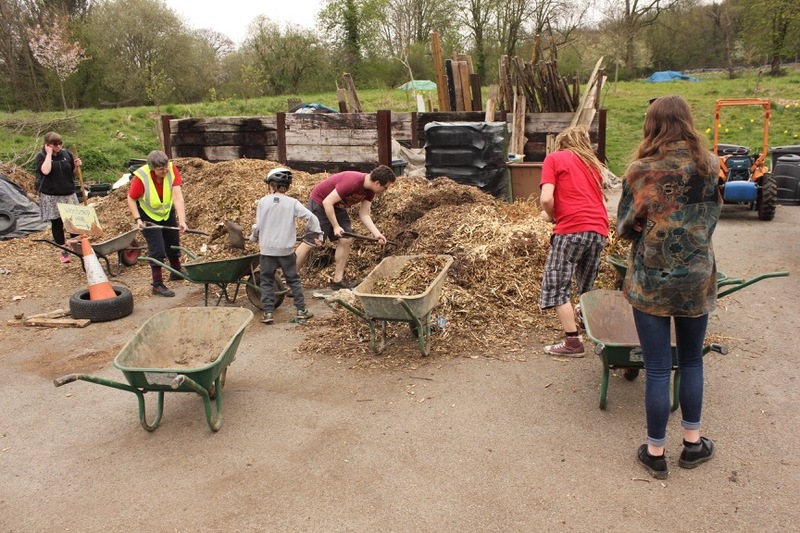 Our destination via back street routes is Organiclea’s innovative Hawkwood site in Chingford, where we have the option of a tour of Hawkwood, or helping out with an activity which is suitable for young and old. On the return journey we’ll call in at a cafe for a bite to eat at around 4.15pm. Meet 1pm on Sun 29th March outside the Ancient House (at the Orford Road/Church Lane junction) in Walthamstow Village. Approximate distance 15 miles. This event is free. All welcome. No booking required, just turn up. 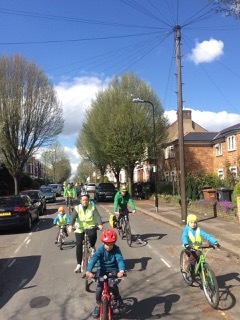 To celebrate the expected removal of much of Walthamstow Village’s rat running traffic during the Mini Holland road closure trial (more information here) we’re running 2 addititional events to make the most of our quieter local streets. A short easy paced 1 hour bike ride covering 3-4 miles. We’ll have a number of marshalls to help keep motor traffic safely away from participants. This ride is especially suitable for families with young children, older people, or anyone who is nervous about cycling in today’s urban traffic conditions. Meet at 11.00am at the junction of Eden Road and Orford Road (note this is not our usual spot outside the Ancient House); we’ll get back around 12 midday. Free, all welcome, you just need to bring a bike in working order. 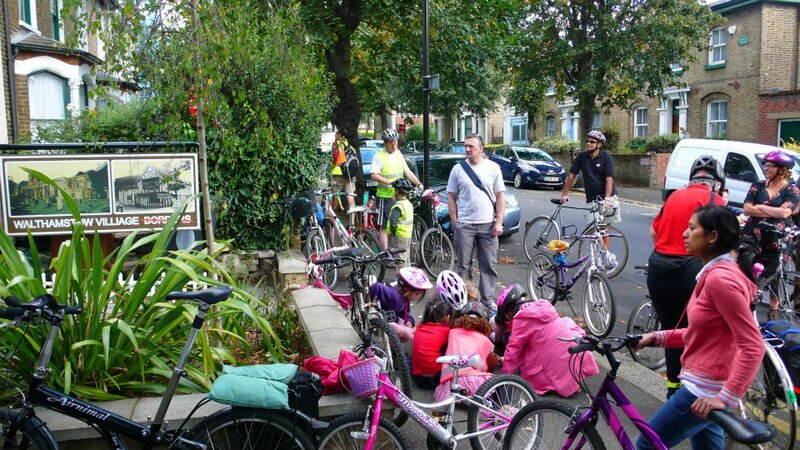 We’re wheeling out our popular Walthamstow Family Bike Club formula with this special Saturday ride. Join us for a relaxed and enjoyable afternoon travelling by bicycle and exploring the nooks and crannies in and around our borough. Our pace is easy, and the maximum distance we do is 15 miles there and back. We will do our best to tailor our route to the abilities of those who turn up, so the distance we cover might be considerably shorter. We’ll have a number of marshalls to help keep motor traffic safely away from participants. We aim to stop off at a cafe at about half time, but we recommend you bring a snack and some water (in case our plans are thwarted); plus of course a bicycle, and any children you can round up. Everyone is welcome, so encourage your family & friends to join us; this event is free. No need to book… just turn up. Meet at 1pm at the junction of Eden Road and Orford Road (note this is not our usual spot outside the Ancient House); we’ll get back around 5pm. We’ll set off promptly at 1pm from outside the Ancient House (at the Orford Road/Church Lane junction) in Walthamstow Village, stopping off at a cafe for a bite to eat around 4pm, and will return to the village by 6pm at the latest. 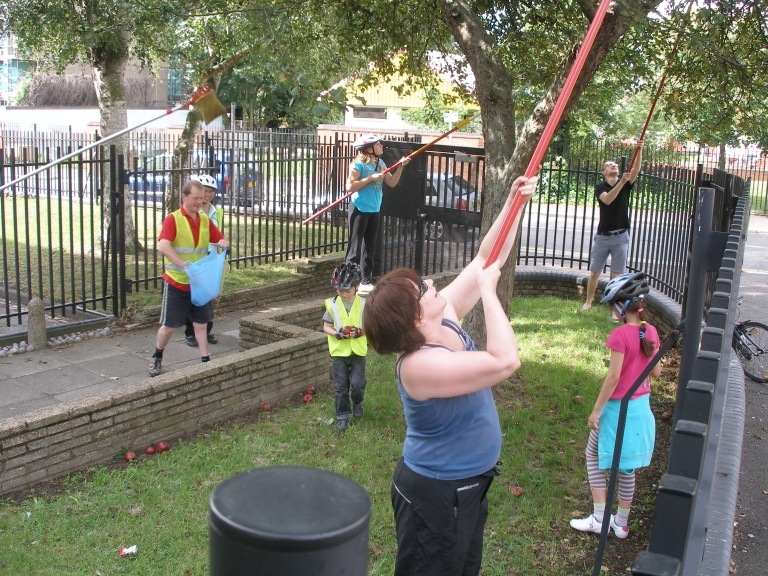 Join us on a fun & bicycle assisted apple scrumping and juicing session this coming Saturday 30th August. We’ll set off from the Hornbeam Centre with fruit picking poles, bike panniers and trailers, do some picking of street trees (and possibly one or two back gardens). We may visit Lloyd Park if there any pears left, as these make the apple juice even tastier. 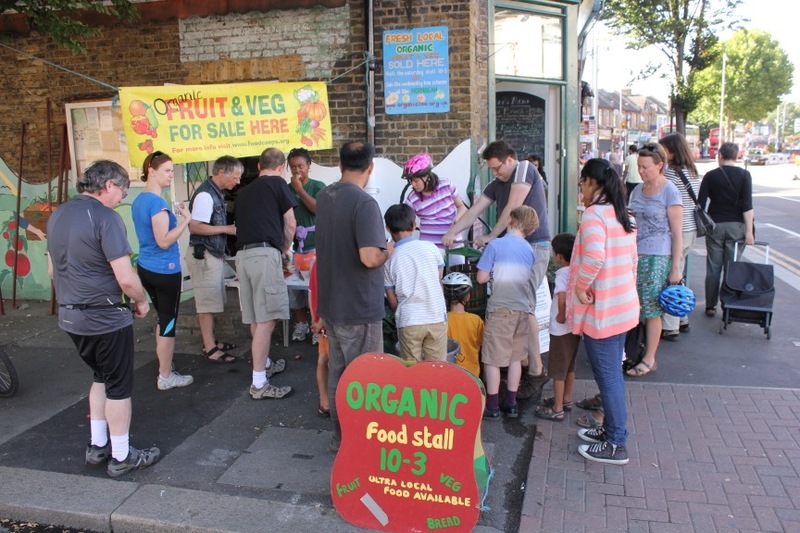 We’ll then return to the Hornbeam around 3pm to do some juicing for passersby (and of course, us) to sample. To round the afternoon off, the Hornbeam Cafe will be open for refreshments, tasty vegetarian meals and cake. Note that our picking will be restricted to the Walthamstow area, so we’ll do considerably more apple picking and juicing than riding, with a round trip of under 5 miles. Meet at 12.30 outside the Hornbeam Centre (458 Hoe St, E17 9AH, one block from Bakers Arms). Or at 12.45 in Walthamstow Village at the junction of Grosvenor Rise East & Wingfield Road. We haven’t yet fixed a destination – it might be the Xmas lights in the West End… we’ll let you know nearer the time. Want to ride but your bike needs a check over? WF LETS is joining our monthly ride on Sunday 13th April, and offering a Dr Bike session at our usual meeting point (outside the Ancient House at the junction of Orford Road & Church Lane) with cycle-knowledgeable trader Jerry from 12noon before the ride commences at 1pm. Ride participants will get an (optional) opportunity to hear about LETS at our mid afternoon cafe stop. 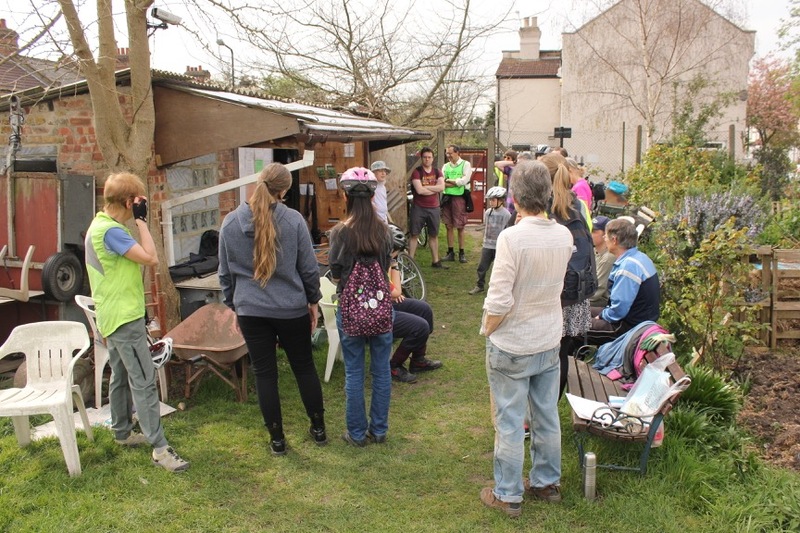 Have some fun with the Walthamstow Family Bike Club and Transition Walthamstow, as we celebrate the arrival of Spring with a cycle tour of food growing sites in Waltham Forest, including OrganicLea‘s Hawkwood site. We’ll set off promptly at 1pm from outside the Ancient House (at the Orford Road/Church Lane junction) in Walthamstow Village, stopping off at a cafe for a bite to eat around 4pm, and will return to the village by 6pm at the latest. Estimated round trip distance will be 15 miles. Several of you have been in touch to ask if we could run another scrumping ride. So feel free to join us for our second fun & bicycle assisted scrumping and juicing session this Saturday 14th September. We’ll set off from the Hornbeam Centre at 12 noon with fruit picking poles, bike panniers and trailers, do some picking of street trees (and possibly one or two back gardens). I’m tempted to swing by Lloyd Park again … a few pears in the juice really makes it. We’ll then return to the Hornbeam by 3pm to do some juicing for passersby (and of course, us) to sample – if last week is anything to go by, our creation will be outrageously tasty! Note that we’ll be mainly in the Village and Lloyd Park area, so we’ll do considerably more apple picking and juicing than riding, with a round trip of less than 5 miles. Meet outside the Hornbeam Centre at 12noon (458 Hoe St, E17 9AH, one block from Bakers Arms). Or at 12.15 in Walthamstow Village at the junction of Grosvenor Rise East & Wingfield Road. Have you noticed Walthamstow’s street trees are groaning under the weight of apples? 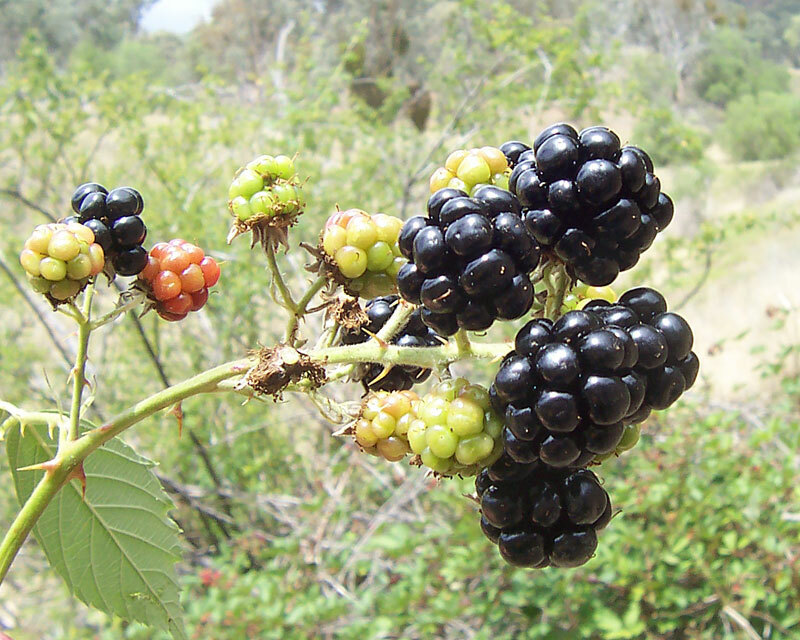 Its going to be a bumper harvest this year, so join us on fun bicycle assisted foraging and juicing session. We’ll set off from the Hornbeam Centre with fruit picking poles, bike panniers and trailers, do some picking of street trees (and possibly one or two back gardens). We’ll then return to the Hornbeam to do some juicing at about 2.45 for passersby (and us) to sample; to round the afternoon off the cafe will be open for refreshments, tasty vegetarian meals and cake. Meet at the Hornbeam Centre at 12.30 , or at 12.45 in Walthamstow Village at the junction of Grosvenor Rise East & Wingfield Road. The Hornbeam Centre is at 458 Hoe St, E17 9AH, near Bakers Arms. Most of the apples we pick will be used on Apple Day on Sat 12th October at Vestry House Museum. More information about Apple Day here. Contact 020 8520 0648 paul.gasson@gmail.com for more details. This is a partnership event with OrganicLea & Hornbeam Centre. Fancy a day riding around central London on car-free roads? Those lovely people (and I mean that sincerely for a change) at Prudential have managed to close some 8 miles of central London’s busiest roads between Whitehall and the City to all motor traffic. If you’ve never had the experience of riding with THOUSANDS of other cyclists along streets that would be suicide to attempt on any other day, come along between 9 – 5 on Saturday 3 August. You can join the route at any point and leave when you like. For those nervous about getting to the event, the route passes very near to Liverpool St, just 15 minutes or so by train from Walthamstow. Bikes go free on the train. Nic will happily meet Bike Club riders at Liverpool Street to guide them to the route. Instead of our usual ride out into local open spaces, Mat will be leading us on a tour of a handpicked selection from 300 displays of art in this years E17 Art Trail. Meet at the usual time and place (13.00 at the Ancient House). Remember to bring plenty of water; we will be stopping off at a cafe along the route. Join us on bicycle assisted foraging of local street trees. We’ll set off from the Hornbeam Centre with fruit picking poles, bike panniers and trailers, do some picking of street trees and one or 2 back gardens (with permission!). We’ll then return to the Hornbeam to do some juicing at about 2.30; the cafe will be open forrefreshments, tasty vegetarian meals and cake. Meet at the Hornbeam Centre at 12 noon, or at 12.15 in Walthamstow Village at the junction of Grosvenor Rise East & Wingfield Road. The Hornbeam Centre is at 458 Hoe St, E17 9AH, near Bakers Arms. Most of the apples we pick will be used on Apple Day on Sat 13th October at Vestry House Museum. More information about Apple Day here. Join us on a bicycle assisted raid of local street trees. We’ll set off from the Hornbeam Centre with fruit picking poles, and trailers to get the apples back to the Hornbeam for juicing with the help of OrganicLea. First raid is at 10am, with a second planned for 12 noon; attend either or both. In case you have worked up an awesome apple appropriation appetite, the Hornbeam Cafe is holding a vegetarian ‘Summer Sizzlers BBQ’ 12-3pm the same day. Meet 10am or 12noon at the Hornbeam Centre (or at 10.15 in the village at the junction of Grosvenor Rise East & St Stephens Close). The Hornbeam Centre is at 458 Hoe St, E17 9AH, near Bakers Arms. Contact 020 8520 0648 paul.gasson@gmail.com for more details. This is a partnership event with OrganicLea & Hornbeam Centre. The Markfield Beam Engine (grade II listed, built 1886) is having a steam day when they fire up the pump so you can see it working. There is a cafe attached. After we are sated with steam engines and cafe fare, if anyone has any energy left we may ride a bit further along the Lea Valley. Instead of our usual ride out into local open spaces, Mat will be leading us on a tour of a handpicked selection from 300 displays of art in this years E17 Art Trail. Meet at the usual time and place (13.00 at the Ancient House).